> Research Library > FICO - APAC > Do you need an integrated solution that simplifies FATCA and CRS compliance reporting? 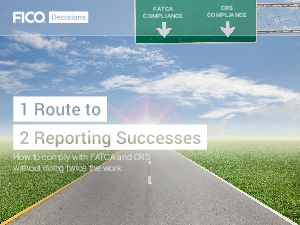 With FICO® TONBELLER® Siron® TCR, you comply with FATCA and CRS in a manner that increases business success. FICO® TONBELLER® Siron® TCR is a single solution that simplifies compliance and reporting for both FATCA and CRS. It lets you leverage common data (CRM, KYC, AML, etc.) as well as powerful common rules and reporting engines. Unified case management helps you increase staff productivity, minimize impact on your customers and reduce organizational risk exposure. In short – the solution also gives you the means to comply with future reporting standards successfully. Learn more. Download this eBook now.